Kids Birthday Party Ideas Bellevue: Check Out Our Birthday Party Options! Create A Memorable Adventure With Our Indoor Playground Birthday Parties! Our indoor playgrounds in Factoria and Alderwood are designed to be top spots when it comes to kids’ birthday party places. Funtastic Playtorium hosts both private and birthday parties to help create a memorable experience for your little adventurer. Our kids’ party place comes with more than just an amazing facility — you receive the support of our helpful staff to make this party one to remember for both kids and their parents. As the infographic entails, Funtastic Playtorium is dedicated to providing an awesome experience for kids of all ages that is as affordable as it is epic. Our facility strives to be your Top Rated Local® kids’ birthday party venue, and every team member is here to assist in enhancing your adventure. Listed below are our basic prices for birthday party reservations. We’re here to provide fun and engaging kids’ birthday party ideas to the Bellevue area, delivering years of fun to Washington residents. Be sure to call us to see how we can help your birthday party plans awesome! From Monday through Friday, parents looking to get the most excitement for the lowest cost can sign up for a weekday party anytime before 3 p.m. Based on which indoor playground you visit, between 14 and 16 children will be included in the price. 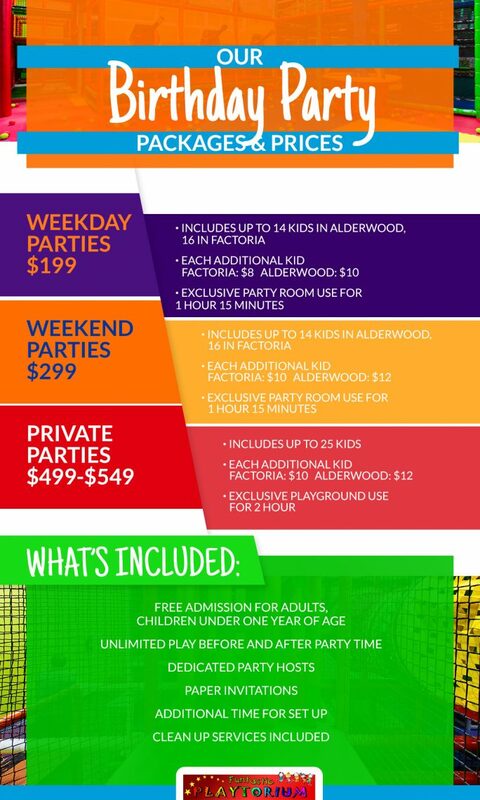 Additional adventures in Alderwood will cost $10 each while our indoor playground in Factoria charges $8 per child. This reservation also allows for exclusive use of our party room for 75 minutes. Unlimited play time is allowed at in our kids’ play area before and after the party as well, giving the kids plenty of time to roam free and burn all of that stored energy. Invitations and cleanup are included as well, making this birthday party package one that is high in quality and easy on the budget! Parents can still find a very cost-effective birthday party venue for their kid in the Bellevue area on the weekends when reserving with Funtastic Playtorium. Our weekend party prices apply to Fridays after 3 p.m. through Sundays and all holidays we are open. You can still expect the same level of service and quality from our playground staff, but keep in mind that there is an additional two-dollar charge per additional child with weekend reservations. We have times available on weekends from 10:45 a.m. to 7:30 p.m. Be sure to call today to learn more and to book your birthday party reservation! Make the day special for your kids by making it fun and affordable for everyone. A private party includes exclusive use of our children’s playground for a two-hour block. Admission for infants and adults is free, and up to 25 kids are included with the price. Each additional child is $10, so plan accordingly if you expect an epic turnout! You can enjoy a dedicated party hosted by our fun and engaging team. Funtastic Playtorium tries to maximize funtime for both kids and adults, as our staff will arrive before and after the party to help with needed preparations. We’ll take care of all of the clean up as well so you can focus on making memories with your little one. Remember that great birthday party idea? Now you can make it into reality as we help put up decorations and organize refreshments, too! Funtastic Playtorium is proud to help bring your birthday plans to life. Our indoor playgrounds in Factoria and Alderwood are here to provide safe, exciting adventures for kids of all ages. Be sure to visit our location next to JCPenney in the Alderwood Mall or call today to learn about our kids birthday party place!